How does Sir Alex get away with being completely wrong? The most repeated football television incident over the holiday was almost certainly that of Sir Alex Ferguson remonstrating with the referee, the fourth official and the assistant referee over what he thought was an incorrectly allowed goal against Manchester United. His finger wagging at referee Mike Dean was described by one football reporter as making him look like a demented pensioner who missed his bus. I doubt whether Sir Alex travels much by bus, unless it’s the team bus and they wouldn’t dare go without him. There is of course a more serious aspect to this. Mike Dean has been roundly criticised particularly by fellow referees, for allowing Sir Alex to get away with his ranting and it is difficult to understand why he took no action against him. Was it as someone suggested that although Ferguson was angry he wasn’t offensive and Mike Dean thought the best thing was explain the reason for his decision carefully and calmly. However, it was such a public display that many referees feel let down by his inaction in their own battle against touchline abuse. The star letter in last week’sReading Post was from a man who took his two sons to a park in Calcot to watch a local match. His morning was spoilt by what he called the barrage of foul language from one of the team managers and a substitute aimed at the referee. Well if it’s alright for a Premier League manager, why shouldn’t he do it as well is possibly what that manager and others may think. The Laws are quite clear, club officials are only permitted (one at a time) to give tactical instructions to their players and nothing more. They must at all times behave in a responsible manner. The referee can expel them from the field of play and its surroundings if their behaviour is irresponsible. 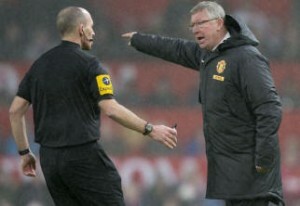 Was Sir Alex being irresponsible or just petulant? I think irresponsible, in that it may influence his own players to believe that haranguing the referee is perfectly legitimate. Of course, if referees think that, they must report it to the club’s controlling FA. We don’t know if the Calcot referee took any action but the FA have said that they couldn’t take any action against Sir Alex as they received no report from the referee, so referees must aid themselves in this matter. What further action would be taken? This usually consists of being banned from the touchline for a fixed number of matches, which as we saw earlier in the season, when Alan Pardew was punished for pushing an assistant referee, is no real punishment. Ferguson, when banned in the past, has still issued instructions by telephone or runners and in fact he has a better view of the game. What the FA must do, is follow other countries where a ban for misconduct by club officials means not being able to attend any matches for a fixed period. As I’ve said before, the dug out is the worst seat in the ground so why was Ferguson so adamant the referee had made an error? The replay showed that the decision to allow the gaol was absolutely correct and it was a United player who pushed the opponent and not the other way around as he claimed. The player in an offside position did not play the ball nor did he interfere with an opponent as outlined in the law. Was it that he didn’t understand the law despite Mike Dean’s calm explanation? One thing intrigues me. When Sir Alex watched the replay in the evening and saw that he was completely wrong, did he ring up Mike Dean to apologise?